Does the fear of having your bike stolen keep you from riding anywhere that you would have to leave it parked outside? Do you think that bike thieves are technically so savvy that no matter what kind of lock you have your bike is not safe? Help us bust this myth and at the same time help those who fear the bicycle thief, to understand how best to thwart their efforts. Most everyone has either had their bike stolen of know someone else that lost their bike. It can be very upsetting to lose your bike, especially if you use it for transportation. The good news is that there are some simple (not necessarily cheap) ways to protect your bike from thieves and you don’t need to carry 20 different kinds of locks. The first you need to do is ensure that you have a good lock. When it comes to locks the old adage of “buy a $ 50.00 bike and a $ 100.00 lock” applies. Remember that a cheap lock is only a visual deterrent and can be cut or removed easily by a dedicated bike thief. The most common lock used by cyclists is a U-lock, however these locks are not all created equal, so check the quality carefully. Beware of locks that have cylindrical keys. These types can be opened very easily with the barrel of a ball-point pen. So now you have your locks, you need to make sure that you lock your bike properly. Based on the responses and our own experience, lock the front or rear wheel and the frame to a solid “fixed post or bike stand.” Then use either your second lock or your cable to secure the other wheel. You have to make sure that the post or stand that you are locking to is secure. As Glen indicated, he has had “sign poles uprooted” so check it before you lock to it. This is especially true in downtown areas where sign posts are often secured to a bracket that has been solidly set into the concrete sidewalk. These bolts that secure the post to the bracket can be easily loosened if they are not already loose. Look for a rack or post in an area that has either video surveillance or lots of public traffic, however as this video that Shona sent us shows, you don’t want to depend on others to watch over your bike. If you can find a bike cage or locked area to put your bike inside, even better. If there are lots of bikes being used at your workplace, maybe you should approach your employer about providing a fenced compound for bikes. If this is not an option, the Winnipeg Parking Authority operates “bike corrals” at the Civic Centre and Millennium Library Parkades. The cost is on $ 50.00 per year. As well Eric tells us that a bike cage is being built in the Albert Street parkade “sometime soon.” [2012 update: It’s built!] Membership for the use of this facility is said to be a mere $10.00 plus a refundable deposit on the key. Just a couple of other things that your might want to consider. If you have a quick release on your seat, either remove the seat and take it with you, or secure it as well with another cable. 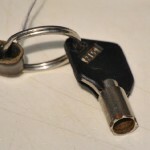 It is also a good idea to keep a spare key at work in case you loose your keys, otherwise you will be the one looking like a bike thief as you try to cut or break a lock off your own bike. I’d rather not go through the hassle of locking up my bike – especially if I just want to pop into a store for 5 minutes. I would like to see a list created of “bike friendly businesses” (especially in the downtown! ), that allow customers to bring in their bikes. For example, Downtown Chiropractic is such a place. I use the same method as others: a U-lock for the frame and a wheel and then a cable lock that I put through both wheels, the frame and to the bike rack. Carrying a cable lock around is not hard to do as you can just wrap it around the frame. I also look at the location where I am parking and try to pick something that is highly visible and gets a lot of good traffic. A bike rack right next to a patio is a great place to park. I am not a fan of people who leave U-locks on bike racks as they can make parking your bike awkward when the rack is getting full, especially when people also leave their cables dangling from the U-lock. If you are riding every day, getting access to a bike cage is a great idea. Often the yearly membership is the equivalent of a day or two of parking a car downtown. Not every employer provides a locked bike cage, however Winnipeg Parking Authority does have “bike corrals” at the Civic Centre and Millennium Library Parkades. The cost to use these is on $ 50.00 per year. Creswin is building a bike cage in the Albert Street parkade sometime soon. Membership for a year is supposed to be $10 plus a $90 refundable deposit on the cage key. Even $50 is not that bad when you consider day parking for cars is $8-$12 and monthly parking costs are starting at $150. Parking a bike is still much cheaper than a car. Carrying two u-locks around sounds heavy! I leave my bike locked up downtown on the main floor of an open air parkade, and so far (4 years), I have been fine with one u-lock securing the front wheel and frame to the stand. I also ALWAYS take my seat with me. I figure that removing my rear wheel would take a bit more effort and time on the part of a thief and might increase public scrutiny. However, in reading other comments I am thinking that I should leave a second u-lock attached to the bike stand for use when I arrive. I agree that 2 U-locks is a lot to carry. Generally I lock my rear wheel and frame with my U-lock and carry a cable that I then lock my front wheel to the U-lock. The bike gods have smitten me often: I have had sign poles uprooted, a hammer and saw taken to my u-lock, and my seat stolen twice, even though I replaced the quick release with a hex bolt clamp. Very important to check the security of the locking location – lots of racks are loose or poorly fastened. I will also only lock it outside for prolonged periods if the area has good public surveillance. Riding an ugly bike helps too! Good advise about the location. I have heard of many people losing bike that were locked to sign posts. Some of these are anchored solidly into concrete and can’t be uprooted, but may, especially where they are located on a paved sidewalk, are simply bolted to an anchor that is set in the concrete. The bolts can be easily loosened and the pole pulled out, assuming they were tight in the first place. Thanks for the feedback Glen. Beth, I dont want the bike gods to smite you, but I used to lock my bike like you and got the rear wheel stolen. On the advice of a bike shop replacing my wheel, they advised two U locks. I lock the rear wheel to a fixed post/stand which essentially secures the frame. Then I use the second u-lock to lock the front wheel to the frame. I haven’t had any problems with this method parking all over for a couple of years. Great videos. Amazing how complacent people are when an apparent bike thief is at work. I don’t want to sound smug in case the bike gods smite me, but so far I have never had a bike stolen. But I’m vigilant about using both a u-lock to secure my bike frame and a cable lock to secure both my wheels, which are quick release. I’m amazed when I see bikes “locked” up with some thin cable. It just makes it too easy! Thanks to member Melissa Dupuis for passing on this helpful video of how NOT to lock your bike!